21 Awesome Gifts for Board Game Lovers (2019) | Nerd Much? 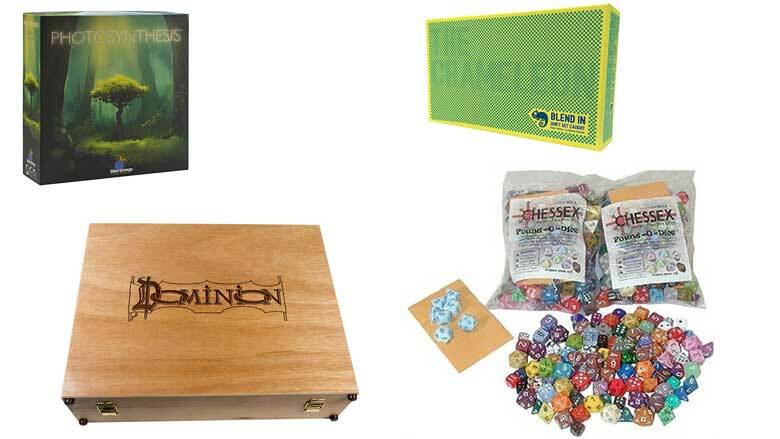 You may be wondering what to get your board game loving friends this Christmas. More board games? More gaming accessories? Why not both? We’ve gathered 20 of the best Christmas gifts for board game lovers for the 2018 holiday season. 2018 was a fantastic year for tabletop gaming. The first PAX Unplugged was a success, and the year was packed with new releases. There’s something here for any gamer! While it would be great to get something extravagant like a convertible dining/gaming table, there are plenty of smaller accessories and new board games out there for any gamer. All it takes is a little touch to add some fun or flavor to game night. 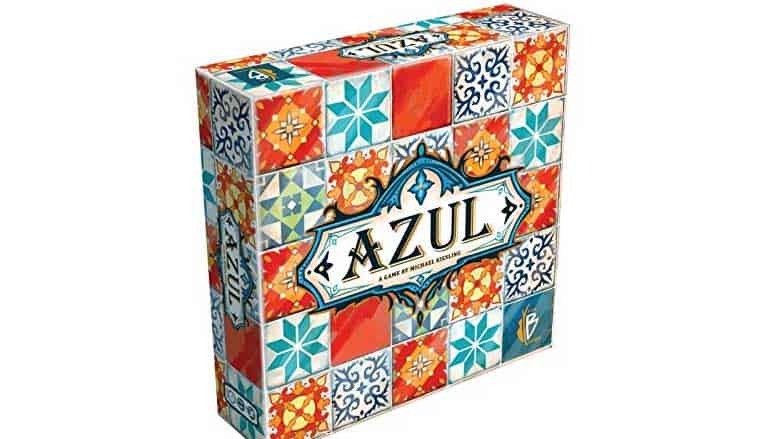 Azul is a simple puzzle game that looks gorgeous and has chunky plastic tiles that feel great in your hand. This abstract tile-laying game is quick and simple enough to attract non-gamers, but there’s enough strategy for veteran gamers as well. Azul is inspired by the azulejos ceramics of the Moors. Players aim to create patterns and sets of tiles on their board and are penalized for unused tiles. It’s quick, pretty, and tactile. What’s not to love? There’s never been a game quite like Fog of Love. It’s a relationship simulator for two players, each player taking on a character at the beginning of a relationship. Throughout the game, the players will overcome challenges that will leave them either strengthen or weaken the relationship. The game plays out like a romantic comedy, forcing players to make decisions like “Should we invite your ex to the party?” When the players disagree, they may find that their characters’ personalities change. There’s no guarantee that the imaginary relationship will survive, but you are guaranteed to get a great story out of the experience! 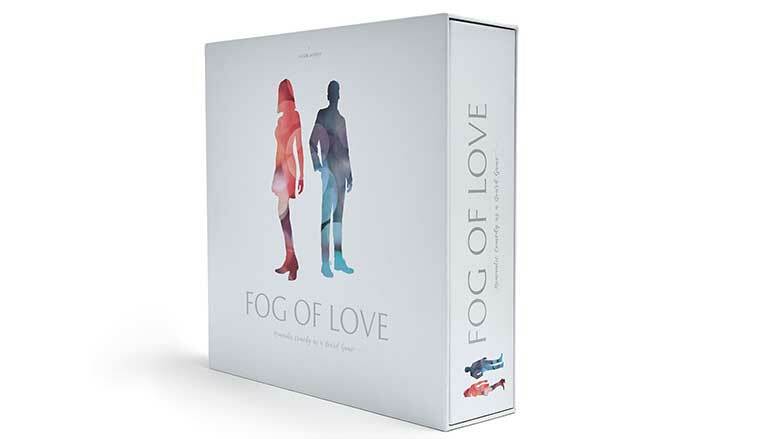 Buy Fog of Love here. Buttonshy Games has a collection of “wallet games” to choose from, many of which only include 18 cards. These come in small plastic wallets, but they aren’t necessarily small games! Some of their best titles include Circle The Wagons, Smoke & Mirrors, and Find Your Seats. If you’re looking for social deduction, strategy, or logic puzzles, there’s a game at Buttonshy that will be perfect. Each game is only $12, so they make for great stocking-stuffers. Clans of Caledonia takes you back to pre-industrial Scotland. Weren’t those the days? Take control of your very own Scottish Clan, and rule the countryside with your… merchants and livestock! 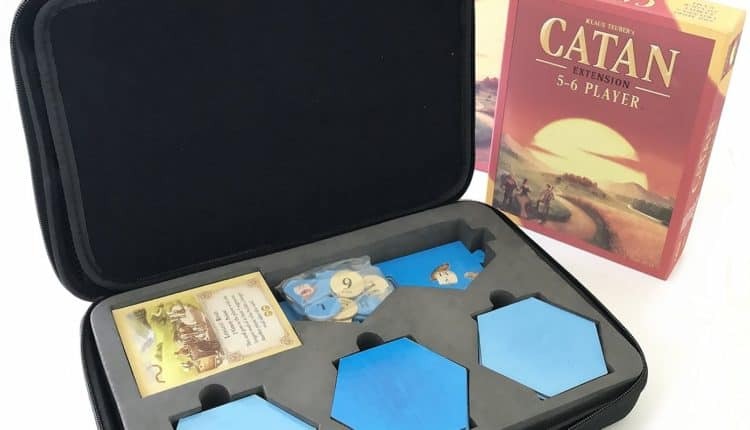 The board is a lovely spread of hexes, critters, and resources that will remind any gamer of the glory days of Settlers of Catan—but Clans of Caledonia offers a style and feel all its own. The modular board has 16 possible arrangements, and scoring tiles make each round of the game different from the last. Earn victory points the Scottish way—with lots of sheep and whisky! 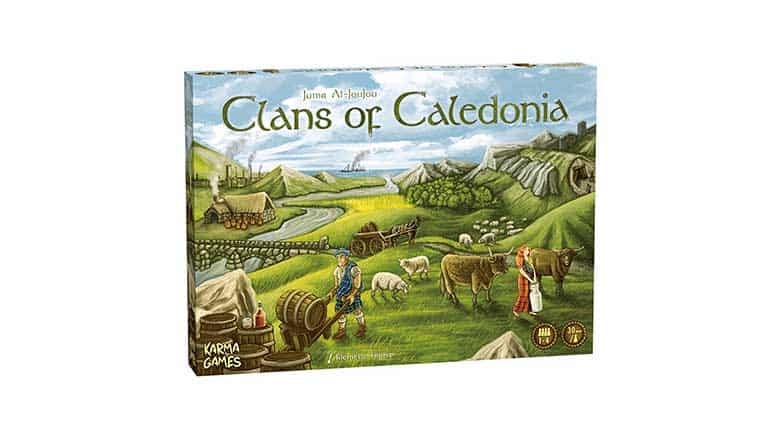 Buy Clans of Caledonia here. 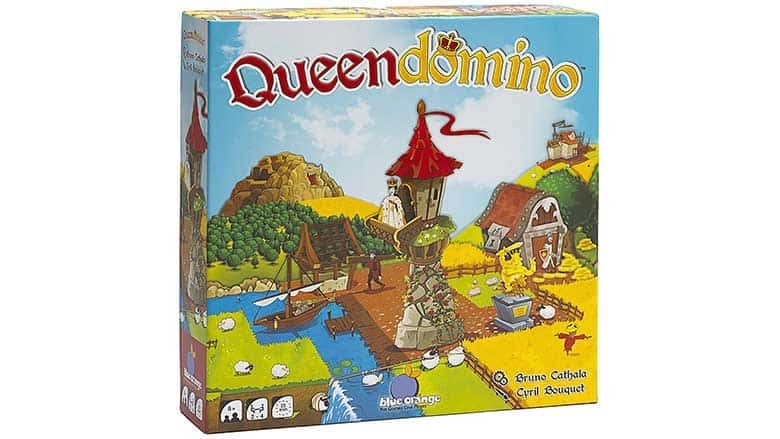 Like its predecessor, Kingdomino, there is a simplicity to Queendomino that will appeal to any type of gamer. Lay down tiles to create a prosperous kingdom filled with fields, towns, and towers. No matter how well you do, you’ll end up with your own little kingdom by the end of the game. Queendomino is the perfect family game and can be enjoyed by kids and adults alike! So you’re a team of adventurers who have lost all of your possessions and now must rob the local mall, but all players control every character at the same time, and there are no turns. Still following? Good. 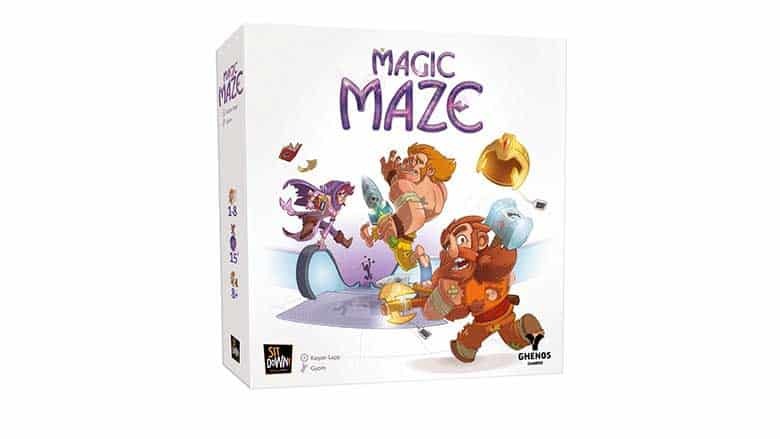 Magic Maze has a strange theme for sure, but it’s a blast to play. There are no turns, and instead of controlling individual characters, each player is able to move any character in one direction or perform a certain action like going up or down escalators. Talking is forbidden for most of the game, so you have to rely on silent, calculated coordination to navigate the characters through the maze of shops and security cameras to steal supplies for the next adventure. The Chameleon is a word game similar to Spyfall; each round has a topic card with 16 words on it. One word is randomly selected for the round, and the Chameleon is the only player who doesn’t know what the word is. All players must give one-word clues that pertain to the chosen word. The Chameleon has to avoid giving themselves away while also trying to determine the correct word. When the word is “apple” and the Chameleon gives a clue like “salty,” things can get pretty funny. Ever wonder how Mad Max gets his mail? No? Well, find out anyway in Wasteland Express Delivery Service, a post-apocalyptic game of fighting through bands of raiders to deliver goods to settlements on the brink of destruction. Players cruise across the board in their upgradable trucks, delivering goods to meet the game’s objectives before their opponents. On the way, there are plenty of chances to kill some raiders and steal their stuff. It’s a game with gritty artwork and different ways to play in an apocalyptic playground—perfect for any Mad Max fan. 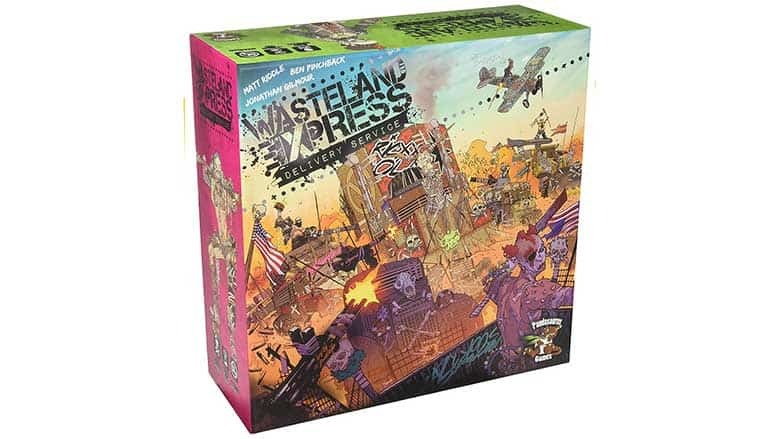 Buy Wasteland Express Delivery Service here. 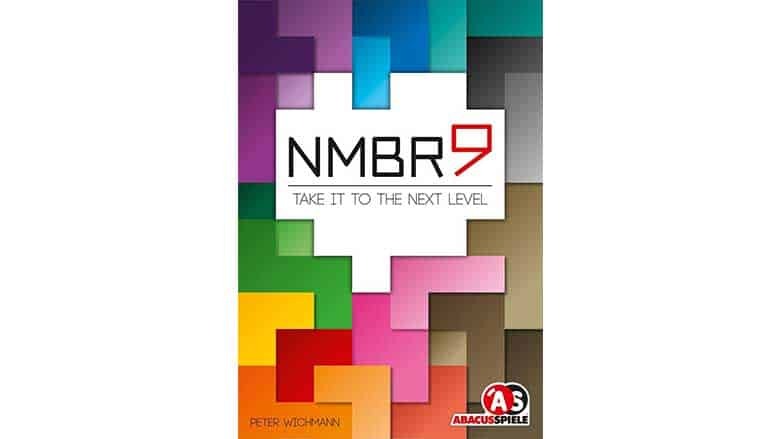 In NMBR 9, players must out-puzzle each other through careful tile placement. The tiles correspond to numbers zero through nine, and they come in blocky, colorful shapes. All tiles must touch one side of another tile, and tiles can be stacked. In fact, the only way to score points is by creating layers on top of your “ground floor” pieces. Tiles on the second layer score their number value, and those on the next layer score double, and so on. This is a simple game with a surprisingly tricky puzzle that is great for any game night. It’s hard to imagine a game much prettier than this. 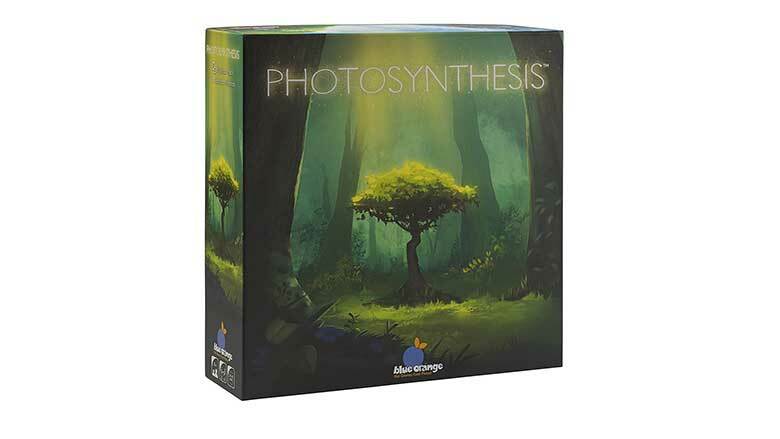 In Photosynthesis, each player places trees to gather the most sunlight. The trees are represented by cardboard 3d trees, so by the end of your game, there will be a forest in the center of your table! Its interesting sundial mechanic makes for clever and sometimes cutthroat gameplay—in no game can you throw shade as literally as in Photosynthesis. The lovely trees and engaging gameplay should catch the attention of any game group. There’s nothing quite like this out there! 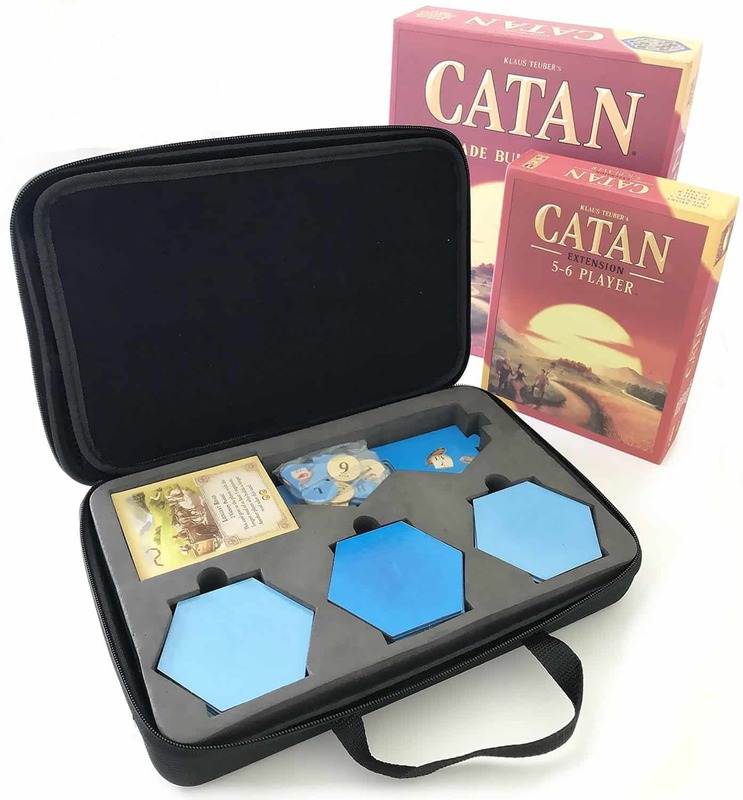 Buy the Catan Carrying Case here. Nothing blings out a game quite like real metal coins—especially if they’re made for a specific game. Meeplesource has a variety of coins for different titles and genres at a decent price. Metal coins can add a nice touch to any game, and there’s just something satisfying about a handful of shiny metal in your hand. 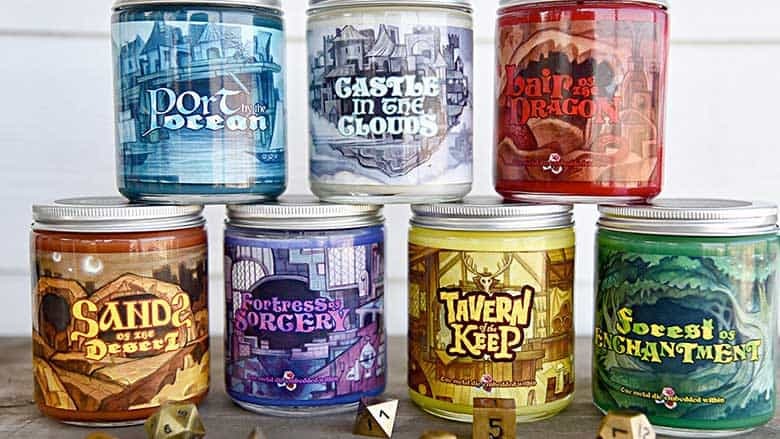 These fantasy-themed candles from Calliope Candleworks can add ambiance to game night with a variety of scents for different adventures. Each 8 oz candle burns for about 50 hours, which should last several D&D campaigns. Okay, this is kind of a game, but not really. 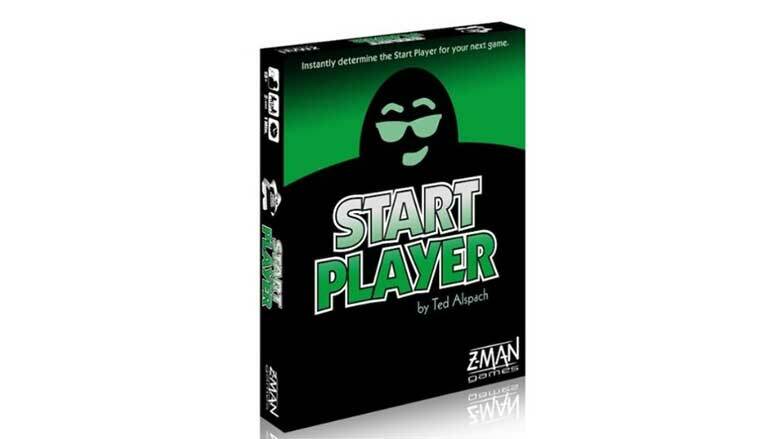 Start Player is a 54-card deck to help determine the first player in any game. Simply flip a card and follow its instructions to figure out who’s starting the next game. This is a cheap little gift that solves the “start player” problem for any game. 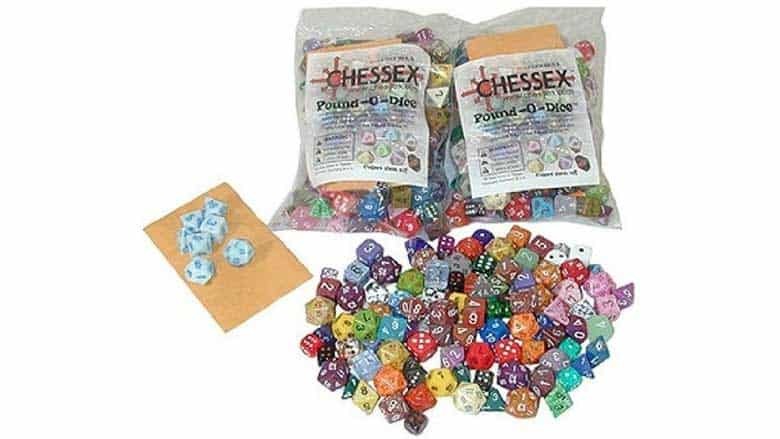 If you’re shopping for an RPG player, the Chessex Pound-O-Dice is a simple gift that will keep them well-supplied with dice for ages, possibly forever. It’s one pound of dice of all shapes and colors… do you need any more of an explanation? Dice trays are great for those climactic moments in any game where you roll dice. They keep dice from rolling off of the table, and they look nice on the shelf. Eldertree makes wooden dice trays with a number of sizes and fabric options to choose from. Custom engraving is also an option. With the cheapest tray priced at $28, this is an excellent value, and it’s a gift that will last for decades. All dice trays are handmade in Kentucky and feature Purple Heart wood and Microsuede fabric or pig suede leather. They take one to two weeks to ship, so plan ahead. There’s no sound quite as satisfying as a nat 20 rolled onto the fabric of a dice tray! Price: $28.00 to $67.53 via Etsy. 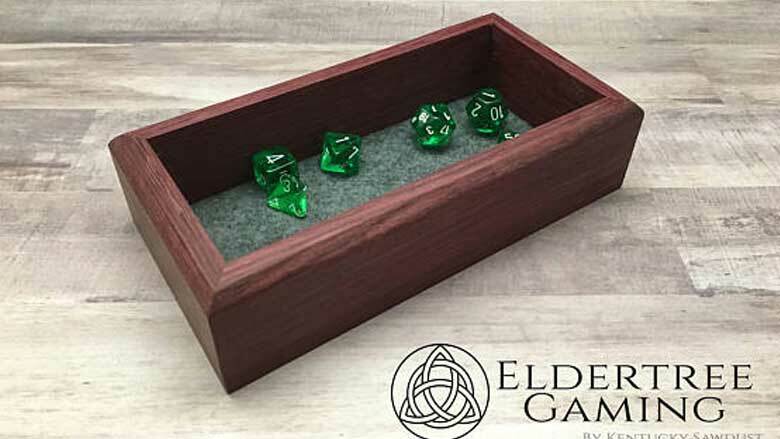 Buy the Eldertree Handmade Dice Tray here. 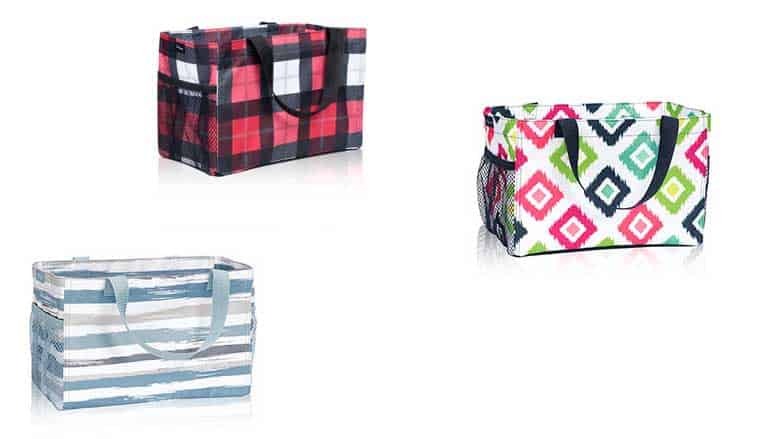 Thirty One’s tote bags are sturdy and can hold a trove of games—perfect for the trek to game night. There are several trendy patterns to choose from, and some bags come with zip-tops. The exterior pockets can carry snacks and drinks—or more games, of course. The totes measure 8” x 12” x 6.5”, are made of polyester, and can carry up to 15 lbs. Customized monograms are available, if you’re feeling fancy. Buy a Thirtyone Tote here. Dragons Play makes an excellent chainmail dice bag to keep your dice secure. 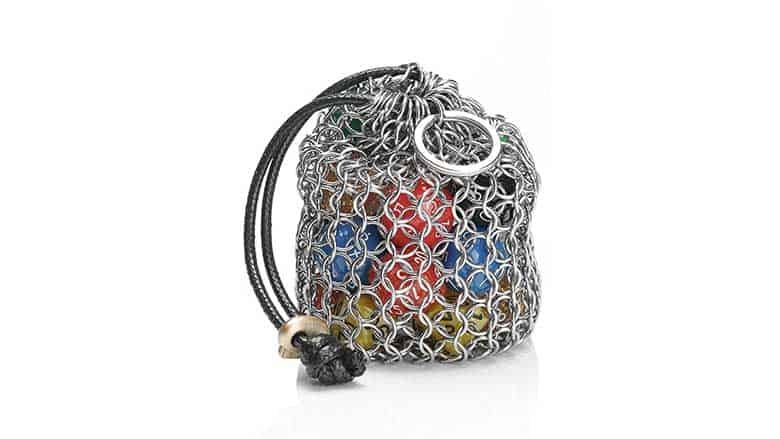 The chainmail is stainless steel, and the bag closes with a coated nylon rope. The metal is sure to keep its shine, and the loops are smoothly closed to prevent scratching dice. Seven dice sets can fit in one bag. For any RPG player, this bag can add a nice touch to game night, and it feels great in your hand! Buy the Chainmail Dice Bag here. Ikea’s Kalas bowls are perfect for sorting game pieces. 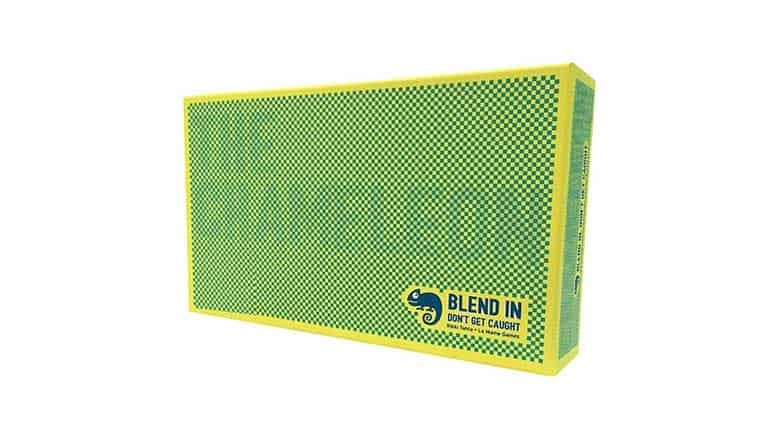 Each six-pack comes with BPA-free, brightly colored bowls to keep game bits from mingling. For games with loads of pieces like Agricola, Concordia, or Terraforming Mars, these can save players a lot of searching under the table. 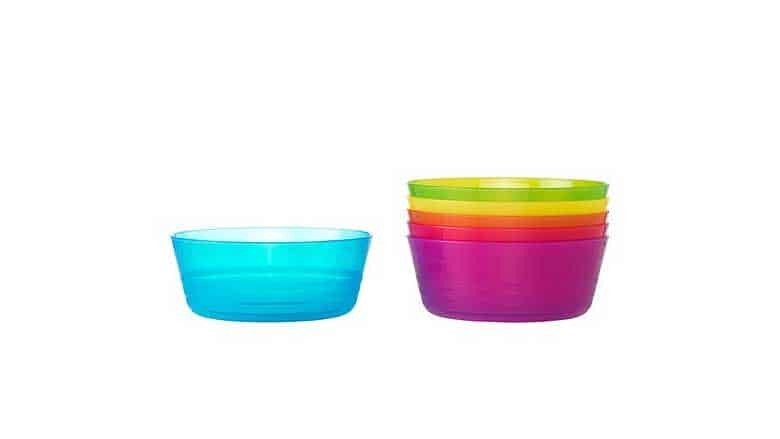 Buy Ikea Kalas Bowls here. With Dominion’s 11th expansion having just been released, there are a lot of cards to cart around. You might have that one friend who still keeps each successive expansion in their original box. What better way to stage an intervention than with The Broken Token’s Dominion Case, which comes with an adjustable wooden organizer. Believe it or not, the case holds up to 6,135 unsleeved cards, which is more than enough room for Dominion’s 4,350 cards released to-date. Just make sure your friend hasn’t been skipping arm day! 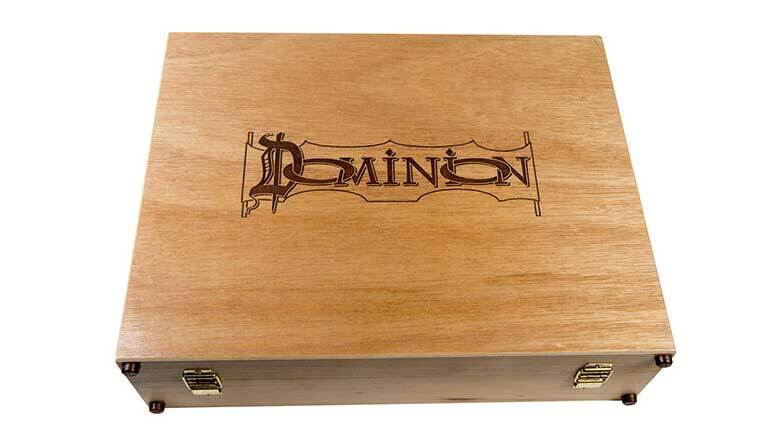 This is the officially licensed Dominion carrying case, and it even has the Dominion logo engraved in the top. The wood has a semi-gloss lacquer, and elastic straps under the lid can hold rulebooks in place. Buy a Dominion Case and Organizer Set here. Card holders can make organizing cards easier, especially for games like Gloomhaven or Ticket to Ride. 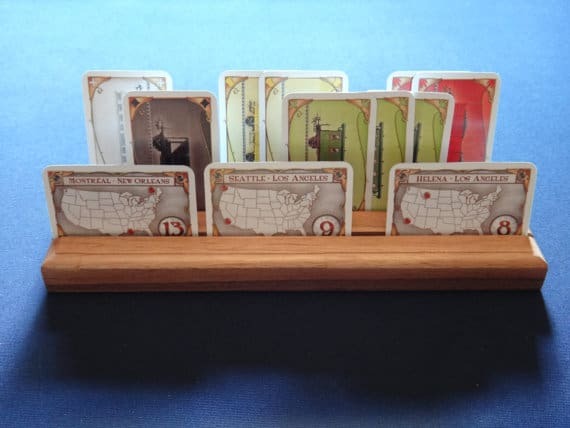 These wooden card holders from Nerds Of Naptown are handmade and have up to three rows for cards. They come in maple, oak, cherry, poplar, and other woods start at just $4.00 each. Obviously, you’d want to get multiple for games with multiple players. Card holders can make game night a bit easier for kids, too! Buy the Handmade Wooden Card Holders here.